Although ‘creep’ is an engineering term, it also applies to human tissue…the lumbopelvis in particular. Spinal and sacroiliac ligaments, joint capsules, facet cartilages and especially intervertebral discs are viscoelastic and are somewhat similar to silly putty. Leave a ball of putty on a table overnight and by the next morning it’s deformed into a flattened pancake. So be it with humans (Fig 1.) We’re taller in the morning than at bedtime, primarily due to disc and fascio-ligamentous deformation that occurs throughout the day. Of course, silly putty is much creepier than discs, fascia or ligaments but, in time, gravity will deform, and sometimes strain, all these materials. As ligamentous creep turns to strain, soft tissues are no longer able to prevent separation of bone and that’s when our problems begin. Bottom Line: Once viscoelastic tissues are strained, they’re less likely to return to their original length and, therefore, are more prone to future injury. I often scratch my head in wonder when reading blogs that downplay the effects of gravitational exposure on human viscoelastic tissues. It’s even more frustrating when clinicians discount the damage from prolonged postural faults such as pronated feet, crooked SI joints, and forward heads. Each-and-every day, the weight of gravity (14.7 pounds per square inch) pushes straight down on our bodies. These compressive forces should be equally distributed throughout the neuro-myo-skeletal system…but are they? Prolonged one legged standing (excessive weight bearing on one limb, i.e., performing bodywork) is an oft-overlooked culprit creating ligamentous creep that may be a precursor to more serious conditions like joint laxity, lumbopelvic instability, sprains, and osteoarthritis. To demonstrate the phenomena of creep, let’s look at the myo-mechanics of a fairly common pain-generating disorder called iliosacral upslip or ‘shear’. In those presenting with true iliosacral upslips, joint apposition between the ilium and sacrum is altered, i.e., “the sacroiliac grooves ain’t groovin”(Fig 2). Since these superior shears are more affected by gravity that other iliosacral dysfunctions, they have almost a zero chance of self correction. During history in-takes, clients often report the symptoms to be much more painful than expected from the injury they describe. In fact, many can’t recall any precipitating event. Typically, when we see this upward shearing force of ilium on sacrum, the person’s SI joints are lacking either form or force closure. In form closure, SI joint stability is dictated by a series of ridges and complimentary depressions that produce friction and help interlock the two bones (Fig 3). But synovial joints like a little movement (joint play), not only to provide spinal shock absorption, but also to enhance lower extremity torque conversions and transverse rotations that travel up the kinetic chain and propel the body through space.2 Fortunately, Mother Nature has accommodated this functional demand by installing a back-up system researchers call force closure. Force closure stability is generated by contractive action of core musculo-fascial tissues such as the pelvic diaphragm, transverse abdominis, multifidus, and thoracolumbar fascia. Together, they provide a sophisticated neurologic feedback mechanism that reflexively interacts with the brain to provide joint stability and coordinated movement…or lack of it as is the case in chronic upslips. 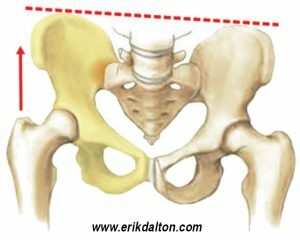 In the presence of chronic upslips, prolonged cyclical loading can deform SI joint ligaments to a point where an act as innocent as slamming on the brake, tumbling on one hip, or clumsily stepping off a curb, can jostle the joint enough to cause the ilium to ‘jump-a-notch’ on sacrum. Here’s a good ‘upslip’ case study of a client named Marion who called complaining of stabbing buttock and low back pain. I’d treated Marion off-and-on for several years for neck, jaw and rib pain resulting from a severe whiplash injury but today was different…her low back and hip were in a world of hurt. This was her first visit since becoming a momma a year earlier and her history in-take revealed two related factors contributing to her injury: 1) Cumulative viscoelastic creep (hypermobility) left over from the relaxin birth hormone, and 2) Prolonged one-legged cyclical loading at her hairdressing job. 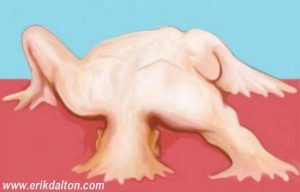 A classic upslip case, Marion presented with acute right-sided lumbopelvic pain, funky gait, and anatomical landmarks showing a 1 1/2″ short right leg, lax sacrotuberous ligament right, OL and psoas spasm right, and superior/posterior right ilium. Spring testing of the right ilium (supine and prone) revealed no inferior glide. Marion’s right QL fired before gluteus medius on the hip abduction test and she lifted the swing leg with the spasmed QL as she tried to walk. Although all her anatomical landmark and gait evaluations pointed to an iliosacral upslip, why do you think she could not identify a traumatic perpetrating event? The books tell us iliosacral upslips are traumatically-induced injuries but Marion first felt the excruciating pain when she got out of bed. Turns out, the incident that most likely pushed Marion over the edge occurred the night before as she stepped off a foot stool. That slight jar caused the hypermobile pelvic ligaments and restraining muscles to collapse and explode into a full-blown crippling hip spasm. Over the years, I’ve seen many cases like Marion’s and I’ve noticed that in the early stages of ligamentous creep, the brain down-regulates nociceptive pain signals. But when the joint finally jams, the brain lights-up the central nervous system with pain and protective guarding to prevent further insult to the damaged area. Here are a couple of techniques that helped fix Marion’s upslipped hip. In Figure 4A, she’s pulling the knee to her chest to inferiorly drag the ilium while I slowly elbow my way through the lumbodorsal fascia, QL, and iliocostalis myospasm. Fig. 4A: Client pulls knee to chest to inferiorly drag on the ilium as therapist’s elbow lengthens QL and lumbodorsal fascia. Once these hypertrophied (hip-hiking) soft tissues regain flexibility and mobility, a maneuver is used to get the sacroiliac “grooves-a-groovin.” But before proceeding to the upslip correction, Marion is asked to do a couple minutes of deep abdominal breathing to help neurologically reset and relax the deep spasmed core muscles. Fig. 4B: Therapist internally rotates and distracts up-slipped hip. Client fires ipsilateral QL while giving a vigorous cough. In Figure 4B, Marion lies supine and I apply an inferior tractioning force to drag the ilium to the first restrictive barrier feeling for neutral leg and hip alignment. By taking the limb into a bit of internal rotation, I’m able to bony-lock the hip allowing the tractioning force to travel through the SI joint. Using my body weight with her thigh securely arm-locked, a distraction force is applied as Marion forcefully contracts the QL and hip-hikes against my resistance. After a few seconds, she is asked cough vigorously to help jostle the joint and reposition the soft tissues. Traction combined with the forced exhalation allows Marion’s ilium to drop down into the groove “from whence it came.” Note: The pain should immediately ease except in those with hypermobility issues or core stability problems in which case a referral to a good functional movement therapist is recommended. Lastly, here’s an effective home-retraining exercise I gave Marion. Lying supine, with her heels circling an exercise ball, she lifts her buttock and slowly rolls the ball side to side. I’ve found this simple routine helpful in normalizing neuromuscular firing patterns while evenly tonifying damaged ligaments. Rest, ergonomic retraining, and regular follow-ups are mandatory until pelvic stability is established. Remember, the first couple weeks are critical; even the slightest jar can turn the ligaments back into silly putty.